I have been waiting for this day for over a month--ever since I announced the "A Picture is Worth a Thousand Words" contest! First of all, before I announce the winner, I would like to thank all 6 of the girls who entered this contest! That's a 200% rise in participation from last contest!! :) Each entry was so different and creative--truly, you all have talent in writing! All ready for the unveiling? For her story, "Blessings", Miss Dalton will receive the hand-made bookmarks. Everyone please congratulate her! The story is printed in full below. :) Enjoy! The lord of the castle ceased staring out over the meadows awash in brilliant color from the sunset and strode quickly to his wife’s chambers where he found a bustle of activity among the serving maids there. Propped up with pillows, his lovely young wife lay, exhausted but joyful, upon the bed with a tiny bundle at her side. Gently peeking around the soft blanket, the man saw the tiny rosy face of his firstborn child, his little daughter. As he watched in silent awe, the babe opened her eyes; dark blue flecked with silver. Just like his. The babe grew into a healthy, happy child. At the age of ten, she began her studies. Sewing, both practical and decorative, embroidery, knitting, reading, writing, and etiquette were her first studies; added to them over the years were cooking, history, astronomy, gardening, horseback riding, fencing, and music. Her book-ish lessons were done in the mornings, her physical lessons in the afternoon; every evening she would sit at her father’s knee and listen as he expounded a lesson from the Bible to her. As the years increased, so did her stature and beauty. She developed a gentle, compassionate nature with a ready smile and a kind word always near at hand for any who had need of them. Ever willing to help, she was often found following the servants around, assisting them while learning the proper way to do certain practical things and listening to stories of their homes and families. Her name fit her well, for she was truly a blessing to the household. One day, at the age of twelve, Blessing accompanied two of the scullery maids to purchase some items for the evening meal. Keeping close to the elder of them, Blessing watched attentively till her keen ears caught the sound of crying. Curious and concerned, she looked around till she spotted, huddled in a far corner nearby, a dirty little boy her age dressed in rags. Quickly, Blessing ducked through the crowd and made her way to the boy who looked up in fear at her approach. His tearstained face touched her heart. “There, there, don’t cry. Everything will be all right,” Blessing said comfortingly. “Nay, it won’t be!” He disagreed, beginning to cry again. “Why ever not?” Blessing asked in distress. Blessing’s heart broke at his sorrow and tears rolled down her cheeks. The maids, seeing them both in tears, scooped them up and carried them to Blessing’s father who accessed the situation, reassured the children and sent the boy to his brother and sister-in-law who joyfully took in the lad. Over the years six more children, two girls and four boys, were born and in addition to her studies and frequent visits to the poor in her father’s district, Blessing’s days were filled with games of various sorts, running errands for her mother, and caring for the children when her ladyship was needed elsewhere or when the nursemaid needed a break. Her bond with the children grew strong; they became Blessing’s best friends and most trusted advisors. “An honorable knight perhaps?” Her father smiled. Three years passed; Blessing had continued spreading love and kindness to the people and her family, assisting whenever possible in the many duties of the household servants. Her father was in the garden one day when a young man was announced. Curious, he looked up as a tall knight, vaguely familiar, entered behind the servant. “Do I know you?” He finally asked. 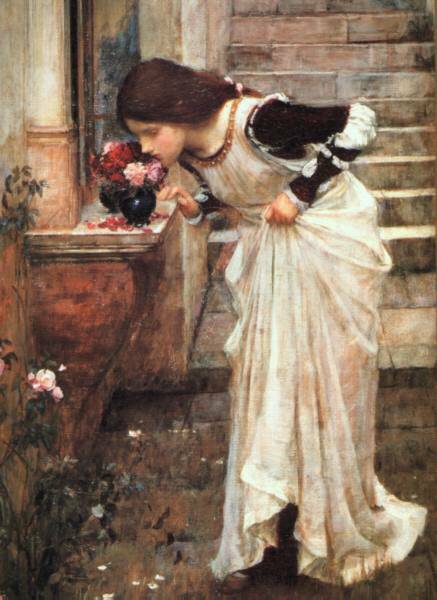 Blessing’s father sent for her and she came immediately, stopping long enough upon descending the stairs to smell a bowl of roses upon a low ledge, unaware of either the surprise awaiting her in the garden beyond nor of the happy future in store for her with her honorable knight. I linked to you at my new blog.